Step 1. This is a roll, not a fold, so the objective is to reduce the number of potential creases. By lining up the pressure points in the rolled jacket, this technique ensures any potential wrinkles will fall along established stress lines. To begin, hold the jacket with the front away from you (as if you were standing behind a person wearing the garment). Punch in the left shoulder so it’s inside out and the sleeve is hanging down. Step 2. Tuck the right shoulder into the hollow of the left one so the lapels line up. The collar will have a tendency to fold over on itself, so make sure it lies flat. 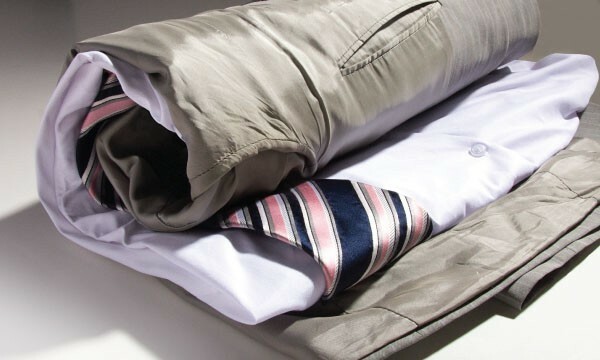 Shake out the jacket so it hangs naturally and pull down on the sleeves to ensure they don’t bunch up. Step 3. Starting at the collar, roll the jacket into a loose tube, like a sleeping bag. Make sure the creases lie along the established crease points of the garment. If you’re really pressed for space, you can even roll a shirt, underwear and socks into the jacket tube for a real hobo bindle look.